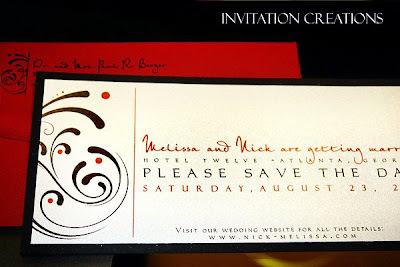 Melissa and her mom contacted me to create her save-the-dates as well as her wedding invitations. She had been to the usual Paper Affair and such and though these companies also carry the same paper products as I do, they don't have my level of personal service nor customization. Did I mention my charm :) So many brides don't have a clue of what they want, but Melissa knew exactly what she wanted: black, garnet red and luster or nickel colored paper. Absolutely no white! She also knew she wanted a very contemporary graphic and a script that was elegant, modern yet subtle. The contemporary feel reflected her as well as the venue. She had not found anything in those other places that reflected her event. She also stated she wanted the graphic represented in all aspects of her wedding stationery, so whatever I used for her save-the-date, she would want on her invitation suite, programs, etc. debating whether or not they wanted one or two layers of card stock, her mom made the comment that the save-the-date should be appealing to the eye since most people place, pin, or attach the save-the-date somewhere in a public place in their house as a visual reminder and that it will be there for months before the invitation arrives. So it should be unique and memorable and worth the extra layer of card stock. What I liked about Melissa, which was a lot, was she didn't like the ordinary. She liked being different. In my pile of samples, she found another save-the-date in the 4x9 size using initials and she loved the concept, but, of course, wanted to make it her own. So I took Melissa's feedback and went in search of a modern graphic. When Melissa came back for her review meeting she brought her team of players, her father, her mother and her fiance. Ruh roh, now I'm nervous. What if she doesn't like them, what if she trashes my work and they tag-team me? Oh gosh, the pressure was on! I really was hoping all my hard work wasn't in vain ...WHEEEWWWW!! She did! Here are the save-the-dates she chose.